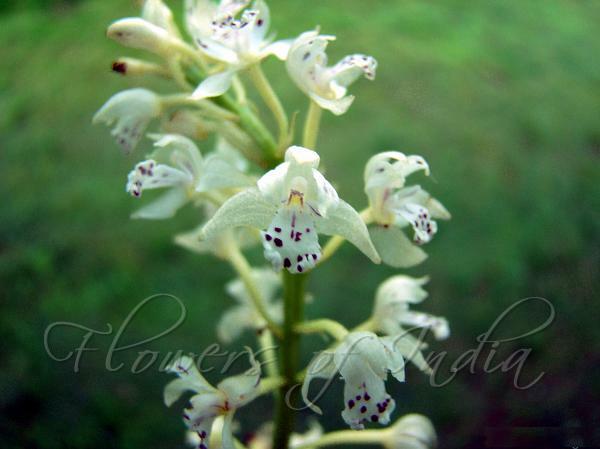 Small Flowered Oreorchis is a ground orchid with 2-3 linear to linear- lanceshaped leaves. Flowering stem has 2-3 tubular sheaths. Inflorescence is rather short, dense. Flowers are small, whitish to greenish-brownish. Bracts are lanceshaped. Dorsal sepal is 6-7 mm long, lanceshaped, concave. Lateral sepals are somewhat shorter but broader than the dorsal, oblong- lanceshaped. Petals are lanceshaped, curved. Lip is broad, white with some purple spots, 3-lobed, with a short slightly sack-like claw, at base. Side-lobes are linear, blunt, 1-nerved, 2-2.5 mm long, almost free to the base. Mid-lobe is oblong, basal half with hairy margins, widened in top half, tip flat, shallowly notched. 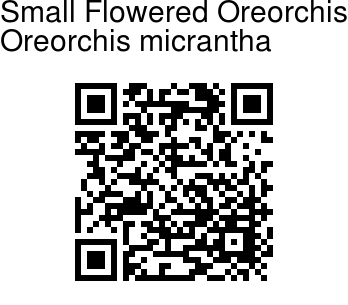 Small Flowered Oreorchis is found in the Himalayas, from Kashmir to Bhutan, Assam, Tibet and W. China, at altitudes of 2100-3300 m. Flowering: June-July.